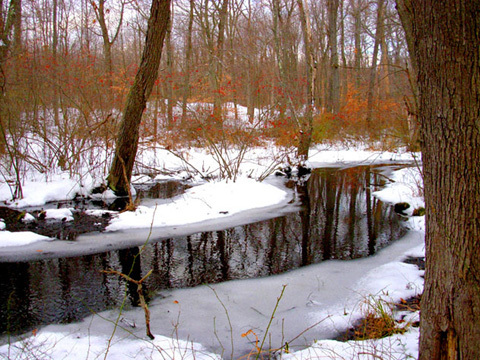 Earthplace maintains a 62-acre wildlife sanctuary, the largest open space area in Westport, with a variety of habitats including fields, forests, ponds, and a stream. The sanctuary is crisscrossed by about two miles of trails, which also extend into an adjacent 11.8-acre property owned by the Town of Westport. The grounds are open from dawn to dusk. For the safety of our visitors, bikes are not allowed on the trails. Dogs are not permitted on Earthplace property. Please use trash cans and recycling bins for waste disposal. Campfires may only be built as part of an Earthplace program. Smoking is not permitted on Earthplace property. Have fun flipping over logs to look for worms and searching in the pond for frogs, but please play gently with the wildlife. Leave animals where you find them, and please do not carve into tree trunks. To report any concerns while on the trail, please call Earthplace during business hours at 203-227-7253. Disturbances outside of business hours should be reported to the Westport Police at 203-341-6000. For emergencies call 911. The Swamp Loop Trail (30 minutes) is the best for viewing spring and summer wildflowers. The trail winds past a swamp, a freshwater stream, a pond, and deciduous woodlands. Hunt for letterboxes along the trail. Wheels in the Woods IV is a universal design nature trail fully accessible to individuals in wheelchairs or walkers, those with strollers, or anyone looking for a flat, easy walk. The trail follows the edge where forest and field meet, an excellent habitat for many species of insects, birds, and mammals. The High Woods Trail (20 minutes) travels through open fields and mixed hardwood forests. Watch for birds and mammals along the edge of the field. This is the best trail for fall hawk watching. The Newman-Woodward Trail (20 minutes) winds through an oak and beech forest with high leaf canopy and silvery trunks. Stone walls and cedar stumps dot the forest, remnants of the days when this was a farm field. The Eloise A. Ray Trail (20 minutes) was once an old farmstead, but this piece of town property has been reclaimed by locust trees and shrubs. The ample fruits and cover of the shrubs make it a good trail for bird watching. The Wadsworth Trail (15 minutes) follows the rim of a wetland depressions. The standing water is host to many amphibians in the spring. This is a good trail for ferns and some wildflowers. There’s a lot to discover while on the trails. Pick up a scavenger hunt at the front desk to get started. Letterboxes - Follow the clues to discover the five hidden letterboxes along the Swamp Loop Trail. Word Hunting on the Newman Woodward Trail - Learn how to use a compass, download the instructions here. We are looking for volunteers to help clear and line trails, remove invasive plants, weed, rake, spread compost, remove trash, plant native plants, etc... To get involved, please send a brief email to: volunteer@earthplace.org. Thank you for your interest in supporting Earthplace. Download our trail map today!